wife (r) in carriage. 42: 'El Presidente', George C. Castagnola, on horse. He started out in life as a fish peddler. 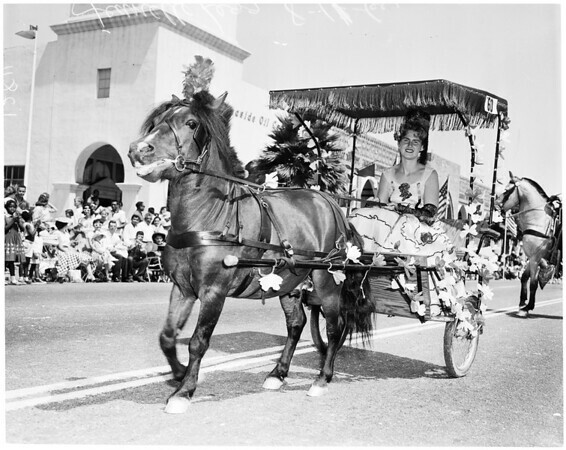 7: Long shot up State St. 8: Santa Barbara Mayor Edward L. Abbott and wife wave from carriage. 60: Float 'El Fandango', Spanish singers & dancers. 59: Jeanette Legg rides cart drawn by tiny Shetland pony. 61-62: Shots looking down State St. Flags line sidewalk as parade passes. Float depicts Old Mission. 39-40: 'The Camarillos' girl riders on white mounts. 25: Float, 'Flamenco'. built and ridden on by family of Mrs. Belen Castro -- largest float in parade."